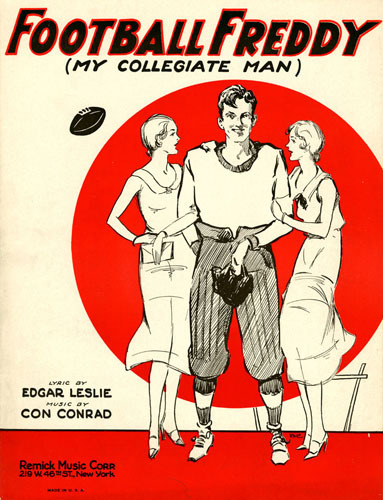 Remember the Rose Bowl: Rudy Vallée and "Football Freddy"
Rudy Vallée and "Football Freddy"
By 1931, singer Rudy Vallée was a bona fide media sensation. His performances were invariably sold out and the screaming adoration of female fans would be repeated three decades later with the Beatles. He had appeared in his first feature film, Glorifying the American Girl, which was to launch a robust movie career over the next several decades. But radio was the medium Vallée dominated. As one of the first of the "crooners" the medium played to the strengths of his singing style and that fueled his overwhelming popularity. In 1928 he debuted his radio show, The Fleischmann Hour, with an estimated 200 million listeners. It was a live variety revue with various guests that became a predecessor to the modern television talk show. Vallée's show was popular among the college crowd and he played to the interests of his audience on his show. 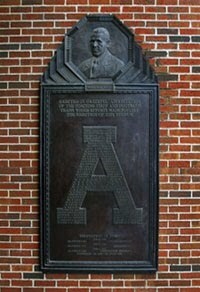 So when he chose to sing a tune about a football star he dedicated it one of the heroes of the 1931 Rose Bowl, Alabama's All-American tackle Fred Sington. The famed singer and the football star had met during the Crimson Tide's trip west courtesy of former Alabama standout, Johnny Mack Brown, who had starred on the squad in the 1920s but had gone west pursuing a film career in Hollywood. The song "Football Freddy" was written by Edgar Leslie and Con Conrad in 1930 and due to Vallee's performance it became a hit. And, as a result, Sington's fame spread well beyond the football field. Other performers committed the song to vinyl including Jack Purvis, Ted Wallace & his Campus Boys and the group Six Jumping Jacks whose version is probably the best known today. Football Freddy, rugged and tan. Football Freddy, my collegiate man. The tune also notes of Freddy; "he's not so good at school." That wasn't at all descriptive of the actual Fred Sington who was renowned for his academic excellence, as shown by his selection as a member of Phi Beta Kappa.